The grocery store is like a board game. Make a wrong turn and you lose. Grocery store operators are very smart and they place products perfectly at the right height and in the right locations that will grab your attention. End isle displays are also very popular and they are usually stocked with the most popular selling products. Aggressive labeling is also another problem with the grocery store. Consumers are buying products that claim to be “natural”, but just because a product at the grocery store claims it is natural, doesn’t mean it really is. The term “natural” on food is a word that has not been cracked down on by the FDA yet. You must be careful when you purchase food at the grocery store. 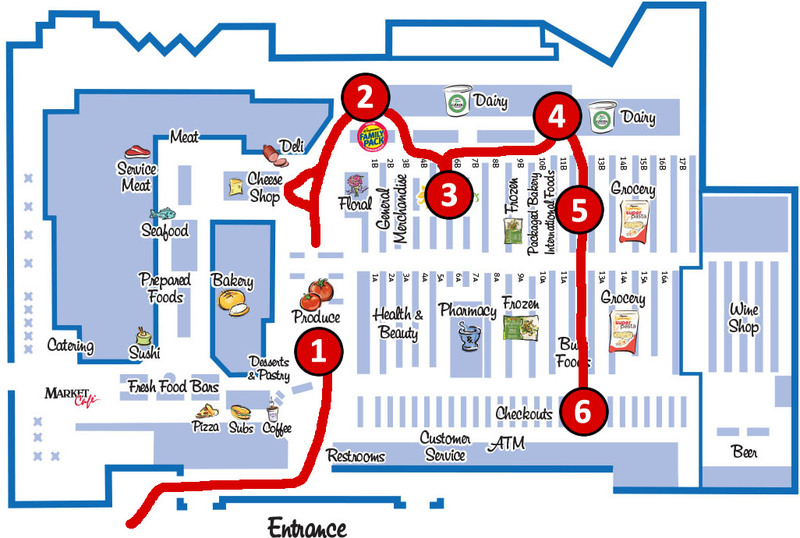 You have to go to the grocery store with a map like Indiana Jones to complete a successful mission of shopping. This mission should exclude distractions and have complete focus on exactly what you came for. 1. When I first arrive at the grocery store I grab a cart and proceed to the fresh veggies. This is where I grab ingredients for my favorite green juice recipe, zucchini, peppers, onions, sweet potatoes, green beans, squash, collard greens, tomatoes, spinach, apples, bananas, etc. This is the section that at least 40% of the items you purchase should come from. As you can see, I skip over the bread, prepared foods, and the bakery sections. 2. On the way to part 2 on the shopping map, I usually grab some cheese such as feta, mozzarella, or some organic sliced cheese. Cheese is great for snacks, salads, or on top of a burger. Don’t worry about the fat, it won’t make you fat. Choose high fat. Always avoid trans fats though! At my second stop I grab organic meats such as chicken, beef, ground turkey, beef patties, organic bacon, and steaks. 3. This part of the store is usually where I find coconut oil, almond butter, beans, low in sugar tomato sauces, oatmeal, all the spices, quinoa, various kinds of nuts and seeds, almond flour, coconut flour, one degree bread, hot sauce, and multiple other healthy items. 4. I only get a handful of items in the dairy section. I rarely eat yogurt but once every month I grab a plain Greek yogurt just for something different to eat that is fast in the morning. I’ll also grab sour cream, string cheese, Kerrygold/Organic butter, almond milk, and coconut milk. Right next to this section they usually have organic Applegate beef/turkey hot dogs too. 5. In the middle isle at my store they have the olive oil that I like (California Olive Ranch) and I usually grab a 70% or higher cocoa content dark chocolate bar for a snack (I eat a couple squares per day). Just a couple things in the middle isle here. 6. Lastly I checkout and leave the store. This is the same exact system I use every time I go to the grocery store. Here is a fact: If you avoid processed foods and junk at the grocery store, then you won’t eat junk or processed foods at home. Please Rate this article. Was it good? Are Healthy Foods Too Expensive? *The advice given on this site is for general audiences, adults who are in good physiological conditions. The programs offered do not intend to replace medical care. Results may vary among individuals based on gender, age, height, and ethnic background. If you are under medical supervision consult your physician. By enrolling into the program, or purchasing one of our products, you agree to the full disclaimer and terms which can be found on the disclaimer page.